As the above graph shows, over the last 35 years, equity has outperformed fixed income and gold by a huge margin. Disclaimer: The above graph is used to explain the concept and is for illustration purpose only and should not use for development or implementation of an investment strategy. Past performance may or may not be sustained in future. Invest in stocks either directly or through equity mutual funds. Buy stocks only if you have a reliable adviser or understand a company’s business and financials to visualise its earnings growth. Equity mutual funds are a better vehicle for retail investors. Here you can leave the stock selection to a fund manager. You have the choice to invest in passive funds such as ETFs, which buy stocks mirroring an index, or in active funds, which rely on the fund manager’s ability to select individual stocks for a portfolio. Does direct investing provide any benefit over investing in equity mutual funds? The conclusion: Equity mutual funds in India have been relatively consistent in outperforming the broader stock market. Equities in general created wealth for investors over 10 years. 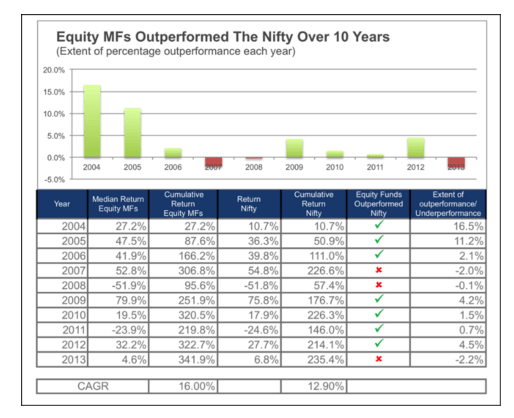 Equity mutual funds outperformed the Nifty in 7 of the 10 years. The cumulative annualised return of Equity mutual funds over 10 years was significantly higher than the Nifty. This not surprising. Mutual funds are specifically designed as well diversified investment portfolios. Professional money managers who ensure rigorous investment discipline manage these funds. The fund managers are generally able to devote more time and resources to monitoring investments, than an individual could, and tend to react less to short term investor sentiment. Periodic evaluation and rebalancing has long been considered the secret ingredient of better investing.